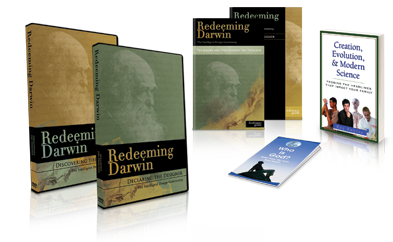 The Redeeming Darwin program equips individuals to understand the tremendous opportunity and issues Intelligent Design vs. Evolution controversies present for strengthening faith and prepares the participant to engage our culture in meaningful discussions about The Creator. Discovering the Designer explores the scientific and societal aspects of Intelligent Design vs. Evolution issues. Declaring the Designer equips the viewer to take the information learned from Discovering the Designer and apply that knowledge to present the gospel in the midst of the discussion. The Facilitator Guide provides everything needed for a person with little or no knowledge of intelligent design or evolutionary theory to lead a stimulating study that could include group discussion. The Reference Guide is an excellent resource that can be used to answer questions not directly addressed in the DVD.